Every grower knows that in order to achieve an excellent harvest, the plants need to be fertilized properly. It is simple – without proper nutrition, you will never be able to grow massive buds. Jay Jackson, the founder and director of Advanced Hydroponic of Holland, was trying to solve this issue 25 years ago when he introduced a brand of fertilizer that dominates the market to this day. Such an anniversary is definitely worth our attention. The Dutch Advanced Hydroponic of Holland (AHoH) produces three-part mineral fertilizers Dutch formula (Grow, Bloom and Micro), and organic supplements labeled Natural Power. Three-part fertilizers are the most popular ways of nutrition among professional as well as hobby growers. The reason is simple – they are easy to use and provide growers with an opportunity to adjust the doses of essential elements according to the actual needs of their plants. One of the tens of thousands of growers, who are using AHoH fertilizers, is legendary Scott Blakey alias Shantibaba, the owner and breeder of Mr. Nice Seeds and CBD Crew. We asked him to share some tips with our readers. We have been using AHoH fertilizers since the early 90s both for indoor and outdoor cultivation and have had excellent results with clones, mother plants and flowering plants. For mothers, we always use two parts of Dutch formula Grow, one part Bloom and one part Micro. For flowering, we use one part Grow, two parts Bloom and one part Micro. For sativa strains, we use lower EC. To prevent plants from growing too high, we avoid using Grow and provide them with three parts of Bloom and one part of Micro. With strains such as Critical Mass, Nordle, CBD Nordle, CBD Critical Mass, grown in rockwool or coco fibre, we usually get a yield of 1 kg under 1000W lamp. The reason why we use AHoH fertilizers for so long is simple – thanks to them, we have been able to keep achieving stable yields, identical taste and aroma. If you want to grow top quality products, such features are essential. One has to agree with that. If you follow the same procedure of cultivation, you should always attain approximately the same results. With the proper and consistent cultivation, the quality of harvest varies either as a result of the change of the growing medium or fertilizers. When you use the inert growing mediums such as coco fibre or rockwool, then good quality fertilizers are absolutely essential. The fact that Shantibaba achieves stable yields and identical taste and aroma is a proof of the consistent contents and quality of AHoH fertilizers. How does one start with developing fertilizers? And how can you find the right recipe that can successfully work for so many years to come? There is no one more suitable to answer this question than the former executive director and founder of AHoH Jay Jackson. Jay, can you tell our readers how the company AHoH was founded? At the turn of the 80s and 90s, I and many other growers used fertilizers manufacture for ordinary plants. However, cannabis has special needs when it comes to nutrition. Thus, we had to combine various fertilizers (quite a complicated process) and it still did not guarantee stable yields. I wanted to find an alternative which would combine easy usage, high efficiency and low costs. With this in mind, I turned to the Research Center for Plant Nutrition in Aalsmeer, Holland. Biochemists had devised a formula, which I and other growers repeatedly tested. Finally we managed to find what we were looking for. Our results were excellent and far superior to conventional fertilizers. The fertilizers were selling so well that I decided to start my own company and start my own retail sales. In 1996, a major cultivation fair took place in Germany. For us, it was a breakthrough moment. The demand for our fertilizers has by far surpassed all expectations. Our small retail business has soon turned into wholesale, and today we distribute fertilizers to more than twenty countries around the world. What is the major reason behind your long-time success? 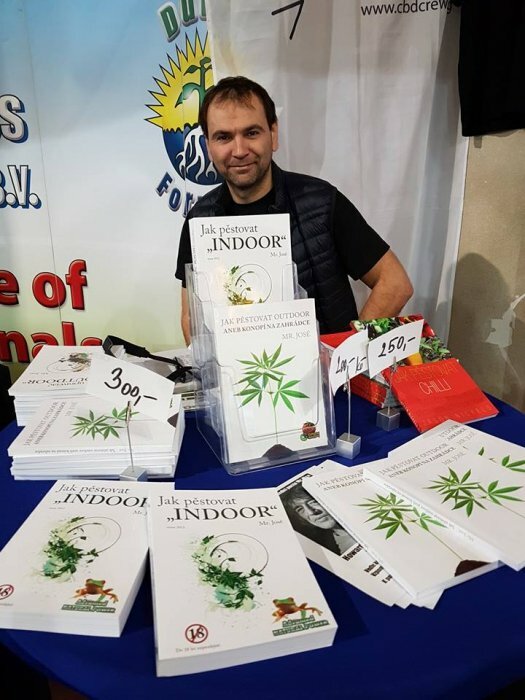 During those 25 years of AHoH official existence on the market, the competition in the production of cannabis fertilizers has been consistently increasing. Some of the companies stayed but most of them shut down not long after they were set up. But our company is still growing and bringing top products to more and more customers. I am not just a businessman; I am also a long-time grower and, from my personal experience, I know what growers need. My main goal is to develop a product with a high content of nutrients that would be easy to use and affordable. Our basic recipe stays the same even though we have added a Natural Power line of products that includes enzymes, rooting stimulator, an accelerator of growth and flowering, and a preparation for harvesting phase. By keeping our approach consistent, we can ensure our customers that they can always rely on our consistently high quality. What does the future hold for AHoH? We rely on time-tested methods. We don’t want to offer our customers new boosters and magical preparations promising double harvest. It doesn't work like that and it’s not fair. With our fertilizers, the plants grow excellently and fulfil the maximum of their potential. We are going to stick to these principles in the future, too. The only thing we had to change in our fertilizers during last years is the investment into new company headquarters. [L1] We need more space to meet the demand. Our perfectly functioning team will keep doing their best to satisfy the needs of the growers. There are just a handful of companies with such a long experience and tradition as Advanced Hydroponic of Holland. We are very happy that they were willing to share their story with us. Take care and good luck with growing!